Jack and I went to a Halloween party at our friends Melissa and Shannon's house. It was fun getting dressed up and being with friends. Tonight Jack and I are planning on seeing our friend's baby dressed up and I will hopefully get to see Malachi in his skunk costume. Then probably heading back to my house to watch a scary movie! I just love scary movies, I can't help it. Especially if I get to cuddle up with boyfriend :) Happy Halloween friends, and Goodbye October! 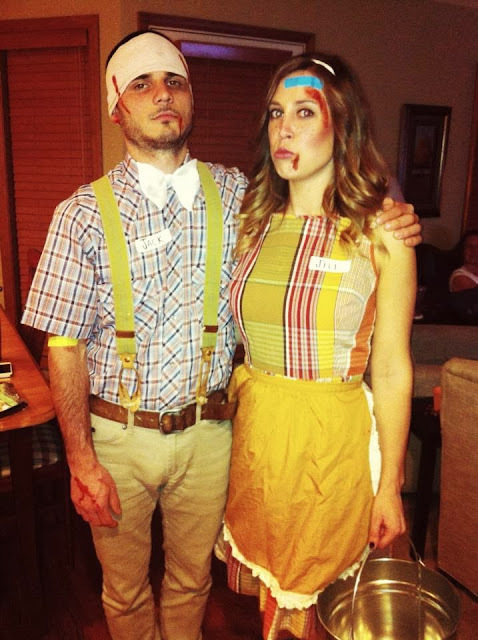 Jack and Jill, ended up being a cute costume! My best friend Adriana and her husband couldn't be cuter if they tried. I don't know a ton of couples who could pull this off quite like them Party on Garth, Party on Wayne!